Charlie Duckworth joins the blog with his build summary of a classic Sunshine Models resin box car kit. Click on any image to review a larger size. Here’s Charlie’s report. The Missouri Pacific and its subsidiaries purchased or built some 4,439 Howe Truss boxcars. The cars had a capacity of 2,926 cubic feet and used a Murphy radial roof. All of the 2,750 MP 46000-48749 series and the first batch of 1,569 cars for the International-Great Northern 6201-6950 were built with indented Murphy ends. These cars were built in 1926 by ACF with a few coming from Standard Steel Car Company. The I-GN 9401-9900 group was built by ACF in 1927 and used the indented Dreadnaught ends. The final 100 cars used Creco door hardware, whereas, the rest of the fleet used Camel hardware. Prototype painting was initially boxcar red with black underframe and trucks with the car body shade being modified over time to a medium brown. Stenciling was white. Sunshine Models (SM) kit 39.6 is made up of seven major resin parts; roof, underframe, sides, and ends. Detail parts such as the doors, underframe crossties, bolsters, roof walk are also resin. Brass wire is included for the various rods and piping used on the underframe and brake details. SM included commercial plastic ladders for the sides and ends. Instructions cover building all the prototype railroad cars that the kits were issued for (ATSF, MP and SLSF), so one should read carefully to determine the details that cover specific models. 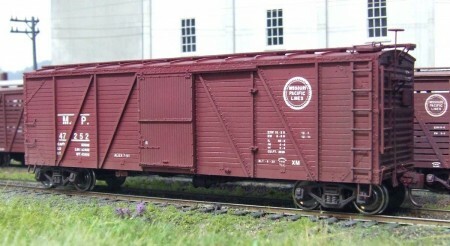 I’ve built several of SM MP single-sheathed boxcars. This kit is a straight forward build. A builder needs to sand the sides to ensure they are straight and equal in length, remove the flash around the ends, and wet sand away the flash around the smaller parts. There are no hidden ‘snake bites’ and everything fits well. The plastic ladders included in the kit are too narrow for the MP cars and could stand to be replaced with wider ones to match the prototype. The decals are close to the MP standard lettering but some of the numbers are non-Mopac, 2 and 5’s as example. My only addition to building the kit are four cut down Lego blocks positioned in the corners to ensure the carbody is straight and there’s a wide surface to glue the ends onto. The car was painted using Tru-Color Mopac Box Car Red but I later found from Ed Hawkins that Tru-Color MKT Box Car Brown is a better match. Since SM instructions discuss a change from boxcar red to a brown tone over time, I’m not losing any sleep over the color but I am using the MKT color on my current MP builds. To prep for decaling, I spray a coat of Tamiya Clear on the carbody as it dries to a high gloss. The trucks are from Tahoe Model Works. The car was lightly weathered with military pigments and then the work was sealed with thinned Testors Dullcote from an airbrush. The wheels have since been weathered with a rusty black color. Thank you, Charlie, for sharing your work here on the blog. Check out Charlie’s website for more layout photos and more Mopac info. Questions and comments can be posted below. Please follow the instructions so your comment can be posted. All comments are reviewed and approved before they appear. Thank you Charlie, especially the note about the decals. I will make a note on my kit’s box about the 2 and 5 numerals. I have built Columbus & Greenville and Georgia & Florida versions of these Howe truss cars. Cars of this general design were owned by RR’s large and small and deserve to be kept in production somehow. Maybe one of the sellers of resin kits will see its potential. Given the common sides and underframe, an enterprising mold cutter could do this as a styrene kit with interchangeable doors, ends and roof options. Any steam or transition era modeler needs some of these. After my comments on the 2 and 5’s you have to wonder why I numbered the model 47’252′! There were other numbers on the sheet….